On a wonderful Sunday morning in October, in the beautiful city of San Francisco, I finished my first ever marathon run. The marathon was as much a test of my physical strength, as it was a test of my mental resolve. It was by no means easy; but I managed to hang in there, and to complete what I had set out to do, 5 months ago. Along with 15000 other participants, less than 1% of which were men, I started my run at 7AM in the morning, from Union Square. The air was heavy with excitement and anticipation at the prospect of running the 26.2 (or 13.1) miles. The elite runners had already taken off at 6:40AM. As the gun went off at 7AM, we were started off in batches. I was in the 3rd batch, and got to the start line about 8 minutes after the first set of runners took off. Like most others, I started off at a very easy pace- about a minute or so slower than my regular pace. We had been advised by our coaches to start easy and pick up the pace as we feel comfortable. This gave me the opportunity to observe what the crowd was upto. A lot of people had “I am running for…” banners on the t-shirts, in support of the honorees for whom they were running this marathon. All of us on the Peninsula Team of TNT were also wearing a note with pictures and names of the 5 honorees of our team. There were a few people with “It’s my birthday today” banners on their t-shirts, and people were wishing them as they ran by. In about 3-4 miles, I had eased into a steady pace. I was now taking short 1 minute walking breaks after running at a good pace for about 6 minutes. From Union Square, we ran towards Embarcadero along Post, Montgomery and Washington. After hitting Embarcadero, we took a left and kept going along the bay, past Fisherman’s Wharf and Fort Mason, towards the Presidio. As we ran up a small hill, we got an amazing view of the Golden Gate bridge. The sun was shining down on the bridge, and there was fog beneath the bridge. It almost looked like the bridge was hanging in mid-air, supported only by clouds. It was a very pretty sight, and many runners took out their cameras at that point. I really missed not having a camera with me at that time. We then ran along Marina Blvd, where I ran into TJ, our TNT team manager- one of the most encouraging and enthusiastic persons I have ever met. She did a great job of cheering me on. After we passed Crissy Field, we hit our first major uphill on the route. It was just about 6 miles into the marathon, and I was feeling quite fresh at that point. I decided to run up the hill at a slightly slower pace than normal. I managed to do that fine enough, with a couple of short walking breaks, and I was quite pleased with myself. The downhill that followed was even more fun, and I managed to conquer it in no time. Then came the next uphill, and I did fine on this one too. The final big downhill, near the Cliff House was very pretty- we were running down towards the sea, and then along the Great Highway. The route then went through the Golden Gate park, where we reached our half way mark. I was quite happy with my pace- just about a minute slower than my regular pace- which I though was good, considering that I had already done the two major hills on the route. And I felt I had enough energy to run the second half of the marathon. I thought it was time I picked up my pace a bit. But then I ran into a hurdle. After mile 15, my quadriceps started hurting a lot. My confidence, which had held strong until now, started withering with every step that I took. I was sure I will be able to run another 3 miles with that pain. But another 11 miles! I started getting scared at the prospect of not finishing the marathon. I then started walking for more time than the usual 1 minute recovery. I was analyzing what went wrong and realized that my over-enthusiasm in tackling the hills in the first half of the marathon might now be adversely affecting me. But I was quite sure I was prepared for the hills, and I was frustrated with my quads for giving up on me. I then decided to ignore the pain in the quads, and started a run-walk routine in the ratio 4:1, to give my quads enough time to recover. By then it was almost mile 18, and we were out of Golden Gate park, and had also done most of the Great Highway. We now had to encircle Lake Merced, before heading back down the Great Highway towards the finish line at Golden Gate park. My quads had finally decided to cooperate, and I was now feeling fine. Then another roadblock came along, which took me even more by surprise. This time, it was my foot that started getting a burning feeling. Every step I took felt as if I was running barefoot on hot coal. This was something that I had not yet experienced on any of my long runs. I had always thought that my ankle was my weakest link. My knees and calf muscles also gave me some trouble once in a while. But this was something new. It would have been okay if I had to go just another mile or two. But another 6 miles seemed like another marathon to go. I knew it was a complete mind game at this point. I just had to tolerate the pain and keep running. So I started a 2:1 running routine. I was running for 2 minutes and walking for 1 minute. Not the best of paces, but it kept me going. At this point, there were just two phrases occupying my mind. Coach Terry, our head coach always says: “Focus on finishing strong.” And coach Mary had concluded the pre-race party with the advice: “Relentless forward motion.” That was all I could think of. In the 6 hours and 17 minutes and 30 seconds that I was running the marathon, I did not ever stop. I was either walking or running all the time. I drank water and gatorade while walking and filled my water bottle while walking. I knew my destination, and I kept going. And it was not just me. All around me, I saw the determination in everyone’s eyes, inspite of the physical pain. Between miles 22 and 23, apart from my feet, all other muscles started aching as well. To my surprise, I got quite emotional at that point. The agony of every step caused me to review the 5 months of training in my mind. In addition, I was touched at the thought of the tremendous encouragement and support of the entire TNT group, including the coaches, the mentors, the captains, as well as that of friends and family- in particular, Niket. And most importantly the thought of the honorees, the fund raising, and the cause, which were the primary reason I was doing the marathon, was quite moving. I was quite overwhelmed with all these thoughts, and had tears in my eyes as I ran that mile. I knew at this point that I would complete the marathon. In the last three miles, I tried to maintain my 2:1 ratio, but even that started proving difficult, and I ended up walking more and more. This is when the TNT and spectator support came in extremely handy. People whom I had never seen before, and probably will never see again in my life, were cheering me on. They called out my name (I had written it on my tshirt) and showered words of encouragement. The Peninsula team TNT mentors, captains and coaches were excellent in their support. Throughout the course, they had stood by the side of the road and cheered the team members on. In addition, during the last few miles, some of them even ran with me for a few miles. When I started my last mile, I knew I wanted to finish strong. I therefore decided that come what may, I am going to run the entire mile. Then I ran into Jocelyn, a captain on our team. Throughout the season, during our long runs, she would to mention to the coaches that whenever I see her (or any other TNT volunteer) on the course, I gave a big smile to them. This time, all I could manage was a very tiny smile; I was just too tired, and wanted to get done. She then asked me whether I would like some company, and started running with me. I was so glad to see the support. When I had just about 0.5 miles to go, our head coach, Terry joined me in my run for about a minute and congratulated me on making it to the finish. I took a couple of very short walking breaks during the last mile. But once I saw the finish line in the distance, I wanted to cross it soon, and kept running. Jocelyn asked me whether anyone was at the finish line to cheer me in, and I said yes, my husband will be around. I was concentrating on running, when suddenly Jocelyn asked me what my husband looks like. I was surprised at the question. I looked towards the side of the road, to see Niket with a camera in his hand, ready to take a picture. I gave the best smile I could! Then Niket started running with me, and Jocelyn decided to go back and cheer other team members in. At the finish line, Niket wanted to cross it with me, but the officials pulled him out. So I crossed the finish line, exactly 6 hours, 17 minutes and 30 seconds after I had crossed the start line. I received a beautiful Tiffany and Co.’s finishers necklace, as well as the Nike Women’s Marathon 2006 finishers tshirt. I am very happy that I completed the marathon. It was a tough and challenging experience- one that I will cherish throughout life. After the 20 mile run, we officially entered the taper phase of the marathon training. This phase meant that we were to run not more than 4-6 miles on our buddy runs and the on-your-own runs. Recovery was much longer this time, as the 20 mile run on the hilly roads in San Francisco did take its toll on us. But the taper gave us a good chance to recover and regain strength for the final run this weekend. During the taper, we had one organized long run of 12 miles on the Sawyer Camp trail. Everyone in the group took the run lightly, as it was “just 12 miles”, compared to the 20 mile run that we did two weeks prior to that. However, during the run, when everyone started getting tired, we realized that 12 miles is not that less of a distance! But it does seem more of a fun distance, than the full marathon, which seems much more rigorous. Overall, the taper has been good on the body, and I am now getting set for the final run this Sunday. I am very happy to report that I completed an extremely beautiful and extremely challenging 20 mile run in San Francisco this Saturday (23rd Sept). My mentor had organized carpools for the run, and thankfully I did not have to drive all the way to San Francisco. Driving to SF was not a problem; driving back after a tiring 20 mile run, definitely would have been tough. On the way to SF, I had asked my mentor what she thought of the difficulty of this run, compared to the previous one. She said this one should be simpler as the route is not as hilly as Woodside. Well, she was miles away from the truth. We ran miles 1-11 of the final Nike Women’s Marathon course, in both directions. The course itself is really beautiful, taking us through the beautiful parts of San Francisco. We started off at the Presidio, around mile 5.5 of the final course. First we ran until mile 1 of the course along Marina Blvd and Embarcadero. We turned back at the Ferry bldg and ran back to the starting point. By this time we had done 9 miles of the route, and I was still feeling fresh and energetic. Then came the second loop on the course, which was much more challenging. This time, we ran in the other direction on Marina Blvd, towards Golden Gate bridge, and then up Lincoln Blvd, and then a couple of other roads, before hitting the Great Highway. We first ran up a big uphill, which was manageable as it was between miles 10 and 11 on this particular route, when I was not as tired. Apart from that, we had two big downhills, and one simple enough uphill. All the time that I was running down the two hills, I was thinking- I have to run up those hills on the way back! The way back was therefore the killer part of the route. We had already run 14.5 miles, and the first stretch we had to tackle was the huge uphill on the Great Highway, towards the Cliff House and a bit further towards Lincoln park. It was just too difficult to run up that one, and I decided to walk that one out. After hitting the top of the hill, I ran downhill without any problems. Then came the second big uphill, and again I walked up that one. I was thinking- I am just so tired, how am I ever going to finish this run? But once I saw the top of the hill, I was just so happy, that I finished the last 1.5 miles of the route with a well-paced run. All my team-mates cheered me in at the finish line, and all three coaches personally came up to me and congratulated me on the run. They were doing that to everyone, so no big deal; but it did feel nice to be personally congratulated by them. The two uphill walks resulted in degrading my time a lot, and I was quite disappointed with myself. As I was stretching out, I remarked about that to one of the coaches, and she reminded me that fortunately we don’t have to run back up the two hills on the final course. That was such a relief! This was a relatively relaxed week. I ran 5 miles on the treadmill, after work, on Thursday (buddy run day). I was planning to run with Rohit and a bunch of others at the Sawyer Camp trail on Sunday. However, I still had a lot of unpacking to do, and therefore decided to run earlier. I ended up running 6 miles on the same trail, but on Saturday. This is a really beautiful trail, and I am sure I will go back and run on the trail even after I am done with the training. It is a flat trail and has quite a lot of tree cover, at least in the early parts of the trail. The best part is that these days, a 6 mile run seems so easy to do! Now I am nervously awaiting tomorrow’s long run- the 20 mile run. This is the longest run of the season, and the last big one before the final event. As I had mentioned earlier, this is a preview of the final course, and promises to be a fun, challenging run. 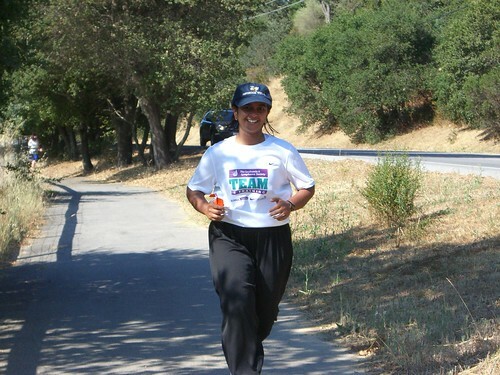 The highlight of this weekend was that I successfully completed a wonderful 18-mile run at Woodside on 9th September, 2006. The course itself was very beautiful, with lots of hills, including a steep hill at the end of the course. We ran in Woodside, and then north along 280, then along Edgewood park and back along 280, and finished up with a loop in Woodside. I managed to finish this run quite well, and felt much better at the end of it, compared to the 16 mile run. My pace did slow down by almost one minute per mile, but I have learnt to expect that on these long, hilly runs. I am very happy that I managed to “finish strong” as our coach puts it. After the run, I managed to ice my sore muscles, and rest for a while. Niket was in town, and we spent the rest of Saturday packing up stuff for my move to a new apartment on Sunday. The move was followed by cleaning up the old apartment and then unpacking in the new apartment. Overall, it was a very hectic weekend; hence the delay in posting this update. I was pleased to see that the recovery time after the long runs is getting shorter, and I am feeling much stronger after the run. My right ankle turns out to be the weakest link, and I need to ice it often to get it in shape for the next workout. As long as it cools down in time, I am fine with bearing some extra pain for a day or two. This week is recovery week for us, with 5-7 miles buddy runs and 6-8 miles runs on the weekend. Next week will be the final long run of the season- a 20 mile run on the final Nike marathon course in San Francisco. These two weeks were very difficult training-wise. I took a long time to recover from the previous 14-mile run, and I was travelling Thursday-Monday of the following week. So I ended up doing the buddy run, but skipping my OYO run on the weekend. In addition, the travel and the jet-setting caused me to catch a cold, cough and fever. I therefore had to miss the track workout and cardio workout for the week just before the 16 mile run. In fact, until the day before the run, I had some fever and I was not sure whether I will be able to go for the run. Thankfully, on the day of the long run, I felt about 80-90% fit, and I decided to go for it. The route was the second half of the Nike marathon- in San Francisco. It involved some gentle hills around Lake Merced, on the Great Highway, and in Golden Gate Park. It was a beautiful route, although I was in no mood to enjoy it. I was completely focussed on completing the run. I managed to do so, although I was extremely extremely exhausted after the run. In fact, I had to walk more than half of a mile between miles 14 and 15. After that, I gathered enough energy to finish up the run with a slow jog. I took more time than normal to finish this run. I was just glad that I finished without injuring myself. The most surprising part was that although all kinds of muscles were aching a lot on Saturday and Sunday, I was back in full form on Monday. This was an unexpectedly fast recovery. On Tuesday, at track we had hill repeats, and by then I was perfectly fine, even on the hilly terrain. I am so happy to be back in action after a week of anxiety. Moving forward, we have a relatively relaxed week, with buddy runs and on-your-own runs of 5-6 miles. The next weekend run is the toughest run of the training season- at Woodside. It is a hilly course, and we are running 18 miles. The hill repeats will definitely help in handling that run. Every week, our Team in Training (TNT) coaches put up a “coaches’ message” on the website. Today’s message was simply too good. It was so apt, that I was wondering whether these guys had the ability to read my mind. They then went on to empasize that from here on, mental strength is very important to complete the long runs, in addition to the physical strength. They talked about planning your strategy, including the walking breaks, fluid and calorie intake, etc. And to finish up the message, they put the whole training program in perspective by noting that this is a one day event that we are choosing to participate in. The honored patients, for whom we are all doing this, do not have a choice and their painful battles with leukemia or lymphoma last much longer than any of our training runs or seasons. How true! The message was very well put. The TNT coaches are really experienced, and have been amazingly encouraging and supportive, while pushing us further and further to our limits. They have a great team of captains and mentors to help them. Each mentor has about 7-8 mentees. Although the mentors are the first point of contact, the captains and coaches pay close attention to your fitness level and muscle aches and injuries. The level of personal attention came as a big surprise to me. They make it a point to cheer in every single participant at the finish line on the long runs. The training schedule is very well planned in great detail. Just follow the schedule and the coaches’ advice, and you will be fine. I would very highly recommend anyone planning to train for a marathon to train with TNT. They know their job very well. They are the best! On Saturday, August 12th, I successfully completed a 14-mile run. This was a simple, flat route along the Bay Trail. It was not too windy that morning. We started from Redwood Shores and ran north toward San Francisco along the bay. We passed under San Mateo bridge, and turned around about a mile before Coyote Point Recreational Area in San Mateo. This is the first time I ran more than the half marathon distance, and I am quite happy about it. Although I completed the run in just 5 minutes more than my predicted regular time, it wasn’t one of my best runs. I think I did not time my calorie intake well during the run, and felt really tired between miles 11 and 13. I walked more than normal on that stretch. But once I regained my energy, I managed to finish the last mile with a good pace and a smiling face. However, the strain on the body is slowly surfacing with a few aches and pains. My left hamstrings are a bit tight, and I will need to follow a regular stretching routine to get them back to normal. I also have a slight pain in the right ankle, which I have been icing all weekend. Hopefully that will be back to normal as well. I am already feeling much better today (Monday), compared to Saturday. These muscle aches are scary. I can definitely feel that I am pushing myself more and more. Hopefully I will manage to get till the 26.2 mile mark. I am quite determined to do that. This was a week of solo runs. Due to some misunderstanding on my part, I landed up for the buddy run at the wrong time. After waiting for 10 mins for the others to show up, I ran 4 miles on Stevens Creek , starting at Whisman park. We had done this trail on the first long run, and on the previous week’s buddy run as well. For the weekend on-your-own run, I wanted to do the Sawyer camp trail once again, hence decided to not go for the planned runs on Saturday. Instead, I headed out to that trail on Sunday morning. Unfortunately, due to some biking race, the trail was closed until noon. I therefore headed back to the Palo Alto baylands trail near my house. I had decided to do 6 miles this time. By the time I started running, it was already late morning. The wind on the bay was quite strong by then and it offered me a good resistance. This was the first time I was running in such windy conditions. Initially I was trying to maintain my usual pace, but that started draining my energy more than usual. I realized that I needed to do something about it. I started slowing down my pace a bit until I was running more comfortably. That helped me conserve energy, and on the way back, assisted by the windy conditions, I managed to maintain my regular average pace for the entire run. The 14 mile run tomorrow promises to pose similar challenges. This run is along the bay on a flat, but windy trail. I better get used to the winds, as I am sure San Francisco will be quite windy. I am getting slightly anxious about tomorrow’s run, as this is the first time I will run more than the half marathon distance. Let’s see how that goes. CIMG2456, originally uploaded by Maui Runner. Believe it or not, this photograph was clicked on my run between miles 10 and 11. This was on the Alpine Road part of the trail, way after the Stanford Dish. I am amazed to see that I am still smiling. It’s definitely thanks to the beautiful downhill towards the end of the run. PS: This is the first time I am posting from flickr.